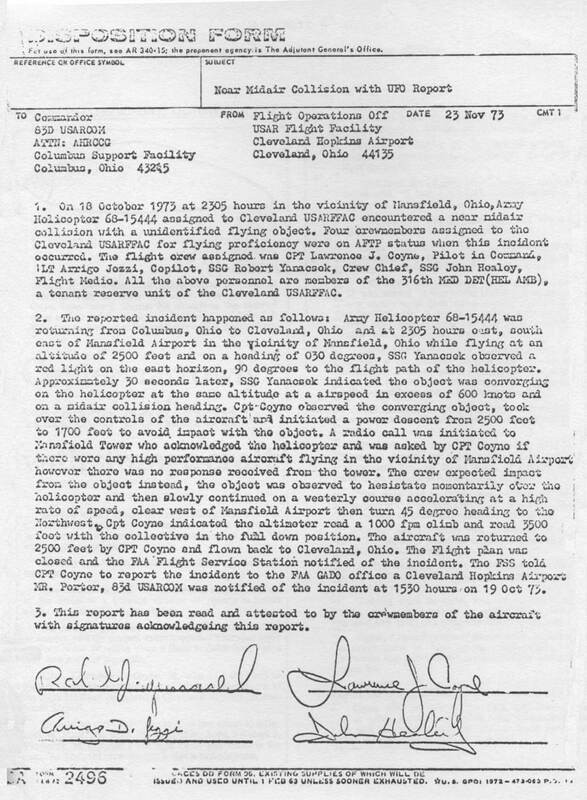 Forty years ago today, a four-man crew of an Army Reserve helicopter was flying over Mansfield, Ohio, around 11:00 p.m. when they “encountered a near midair collision with an unidentified flying object,” according to the official report, signed and submitted by the crew after the incident. A full explanation for this terrifying UFO close encounter has never been offered, and to this day, the helicopter-UFO incident remains one of the most credible — and terrifying — in the history of the subject. “We were flying along at about 2,500 feet when the crew chief on the helicopter observed a red light on the east horizon. He then informed me that the light was closing on the helicopter — that it was coming at us on a collision course,” Coyne told this reporter in 1975. “I looked to the right and observed that the object became bigger and the light became brighter, and I began to descend the helicopter toward the ground, to get out of the collision course path. We were descending and this object was like a missile locked onto the helicopter, only it came at us on a perpendicular angle, to hit us almost broadside. With the unknown object hovering in the air above the helicopter, Coyne and his crew suddenly noticed a light coming out of the aft end of it — a light that swung 90 degrees and came into their cabin. The helicopter topped out at 3,800 feet and the four men felt a bump, “like turbulence, at which time we had control of the aircraft again. I had control and we went back down to 2,500 feet and then continued on to Cleveland,” Coyne said. Lending credibility to this case were eyewitnesses on the ground who observed the UFO-helicopter encounter. The Army didn’t prevent Coyne and his crew from speaking out about their experience. In fact, Coyne was allowed to recount the UFO incident to the United Nations in 1978, as seen below, under the sponsorship of Grenada. “We have two objectives: To make flying safer with regard to unidentified and poorly understood phenomena in the atmosphere. And the second objective is to collect, analyze and then report high quality data from the aerospace world on the phenomena, to help us understand them better,” Haines, 76, told The Huffington Post. According to Haines, on an average daily basis, since the creation of NARCAP, he’s received six to 12 reports a year. He absolutely believes there are real dangerous or safety issues that come up between pilots and some UAP. “It qualifies as a genuine UAP encounter. Multiple witness cases are very important and should command the attention of aviation officials. In the Coyne case, its color, speed and apparent shape — those are all important physical characteristics that can be related to other pilot sightings. “I think the Coyne case ranks very, very high in credibility. One reason is Coyne’s reputation as a good pilot before this happened. And his courage — the fact that he was willing to come forward with this very bizarre story and to stand by it says an awful lot. And he would give encouragement to other pilots to do the same.